Yesterday I was studying the Colette Patterns’ Negroni men’s shirt pattern. I quickly discovered she does things a little differently from convention and, IMHO (I’m no pro by any stretch of the imagination), not any easier or better. The first bell that went off in my head was triggered by the fact that there is no collar stand on the Negroni shirt. 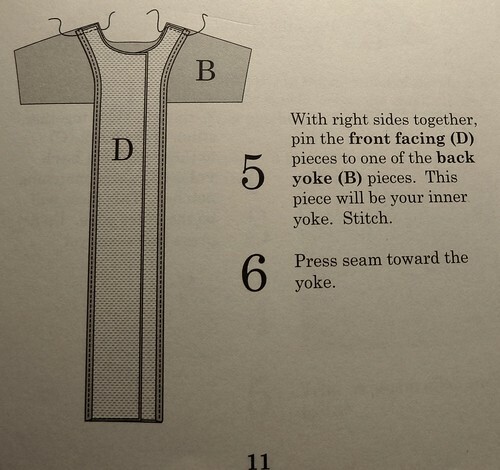 It’s true, I was brainwashed by David P. Coffin’s Shirtmaking book, which I read cover to cover, and agree that all shirts should have a yoke and collar stand. For me, it represents quality but in this case, I can overlook it. The second issue I encountered was the way she joins the front and back yoke, first she joins the front facings with the inside yoke. After attaching the back of the shirt to the outside yoke, you attach the front facings, sewing around the collar like you would on jacket construction. And here’s the problem with attaching yokes in this manner, you can’t sew it properly and she states in the pattern, “You will not be able to stitch all the way to the neckline, but stitch as close as you can.” You end up with a gap where you can’t sew which drives me nuts! Sure, you can’t see it from the outside but I know that small gap is there and I don’t like it. 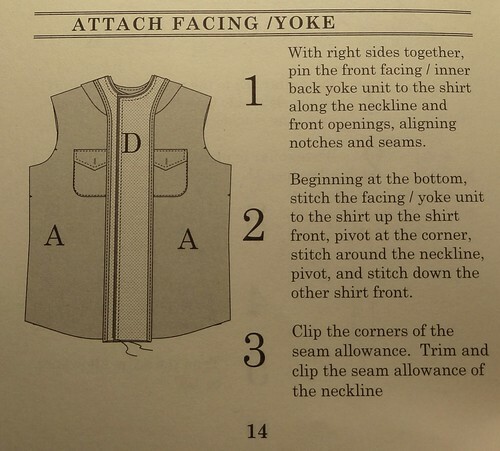 In comparison, here’s how Kwik Sew attaches the front yoke to the back in a very neat, efficient way. First you sandwich the back of the shirt between the inside and outside yokes then press the yokes up. The first time I tried this next step, I had to sleep on it before figuring it out. First you pin the right (or left) front piece to the outside yoke piece, then you take the inside yoke piece and bring it to the front of your work, moving the shirt front and back to the side and out of the way. Pin all four layers together at the shoulder and sew (the shoulder) seam. Repeat on the other shoulder, turn everything right side out and voila, a neat and tidy yoke attachment, I love it! No gaps, no sewing acrobats, simple, neat and clever. I checked the plackets and cuffs, more on that later. This entry was posted in Shirtmaking by Tabatha. Bookmark the permalink. Very interesting discussion. Because it’s also the most confusing part of the construction process, it’s where i’m least likely to diverge from the pattern instructions. If time permits I might make two shirts from two different patterns to allow myself a more critical perspective. On the collar issue, Peter mentioned that drafting our own collar pattern will be part of the sew along, probably to address this aspect of the Negroni pattern. Thanks for your comments Dan! I’m going to make the Negroni out of my muslin fabric but I think I might stick with Kwik Sew 2777 for my paisley fabric. Have you made shirts before? If not, you may become addicted, I really enjoy the process! Hi there! This is Sarai from CP. I just wanted to follow up on your comments. The Kwik Sew method does indeed look good. If I’m reading it correctly, it’s possible to attach the yoke in this way because the collar is attached differently than on the Negroni (i.e. the collar is sewn on after this step). I tried to make the collar attachment step simple to do by machine without fuss, but of course some of it comes down to personal preference. I can’t really address the lack of a collar stand, because that’s the style of the pattern (camp collar, a very casual and semi-retro style). I love that Peter is addressing modifying the pattern to make it dressier! Hi Sarai, thank you for dropping by and piping in with your wisdom. I agree, attaching the collar stand and collar can be tricky getting the edge stitching close to the edge without messing up on the other side of your work. Certainly not for the faint of heart. I’ve ripped a few out until I’ve been able to get them as close to perfect as I could. Glue and double sided, wash-away tape or thread can be your friend. Oh, and patience too! Today I was considering drafting a collar stand for your shirt and attaching your yoke as they do in Kwik Sew 2777, I’ll have to play with it. After all, what’s a muslin for? Your placket is text book, I’m looking forward to it! I couldn’t even understand what Peter was saying to do to attach the yokes! ACK! thankfully, I’m not using that pattern, so I won’t get in trouble for breaking the rules. eek! Excellent, I’m glad I could explain it in a way others can understand! 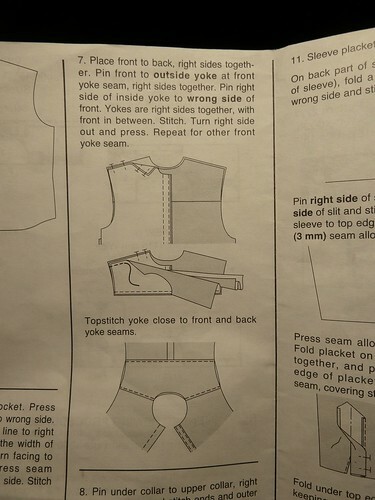 Thank you for this excellent explanation–I’m very much a beginner with sewing apparel and completed my first blouse, sleeveless, no collar stand–and am ready to try another blouse with more steps. 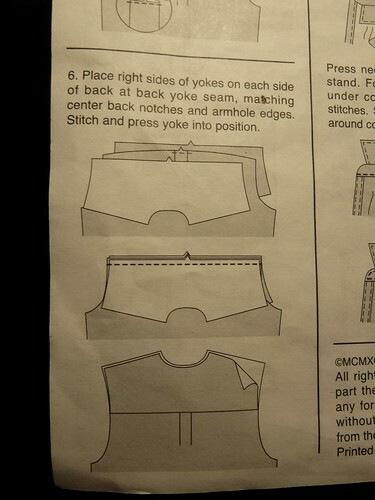 Can this procedure for applying the yokes be used with the Negroni shirt pattern? I like the casual retro style of the Negroni and am hoping to make one for my husband. Thank you again! Thanks for this post … I just finished reading David P. Coffin’s book, also, and have been attempting to find a pattern to make a shirt for my husband, that at least starts with some of the features he mentions in his book. I’ve made many shirts over the years, and find that patterns have been dumbed down, as well. Many are simply a front, a back, a collar, a sleeve and a pocket, and of course, facings. I’ve never liked the finished product, entirely. I really want to learn to make a shirt as the professionals would. I think you gave some really good information here, that will help me to do so. Thanks!